Some 25 members of the association initially produced this wine in 1992. Requirements for participation are the attainment of a minimum must weight of 18° KMW (around 88° Oechsele) or a minimum alcohol of 12.5% – and passing the scrutiny of an annual jury tasting. 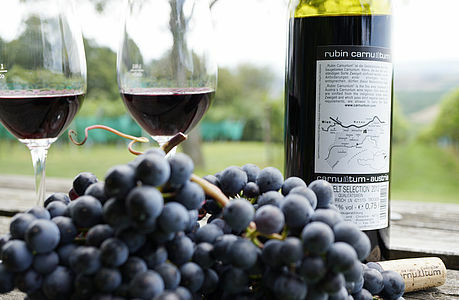 Only the regionally typical variety Zweigelt may be used for the production of Rubin Carnuntum, a vine that thrives in the favourable microclimate of the Leitha Range and the Danube meadows. Rubin Carnuntum wines are presented with the region’s symbol, the Heidentor, on the capsule.